The remains of a police paddy wagon. 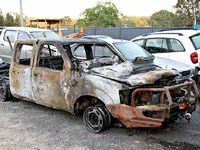 POLICE were pelted with pavers, rocks and bottles, and a police paddy wagon torched as a party raged out of control in Yamba in the early hours of yesterday morning. Fifteen people, most of them juveniles, were arrested as a result of what police described as a riot. Thirteen of them have been charged with a string of offences, including four adults who were each refused bail when they appeared in a bail court hearing in Grafton yesterday. Police had been called to a noise complaint in a little-used building in Deering Street in the Yamba industrial area about 11.30pm and issued a noise abatement notice, but returned again about 2.30am as the noise again escalated. It was when they returned that problems started. 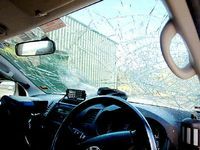 They said that when they arrived they were confronted by about 20 people who armed themselves with bricks and began smashing the windows and panels of the police car. When the officers attempted to intervene they had rocks and bricks thrown at them. The officers fled on foot and called for back up. 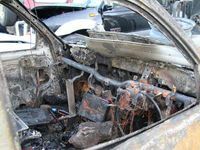 When they left the paddy wagon, which was worth an estimated $50,000, it was torched. The officers stayed close to the scene collecting evidence until support arrived. Another police vehicle came to their aid and was also pelted with rocks and bricks. Police from across the command responded to the incident and arrested 15 people, including the owner of the complex and his wife. 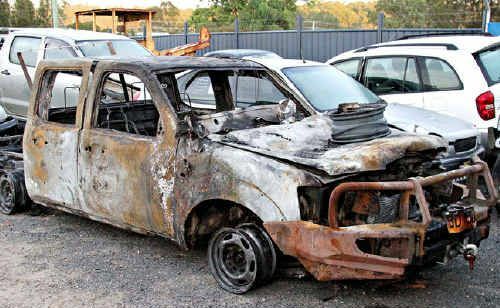 Coffs Clarence Area Police Commander Mark Holahan said it was fortunate none of his officers was hurt in the incident. “Those who attended made a quick assessment of the threat and moved to safety,” he said.